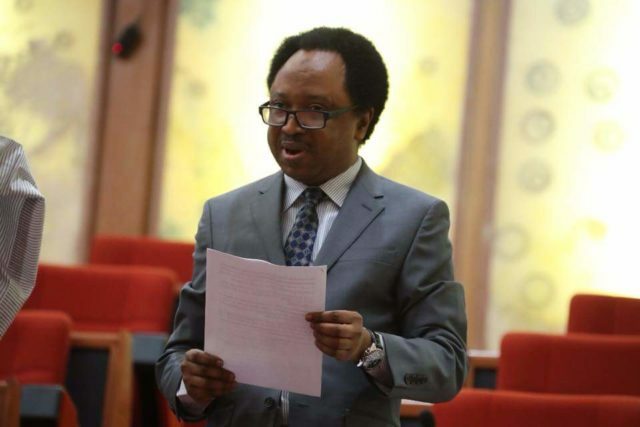 The senator representing Kaduna Central Senatorial District, Shehu Sani, has urged Nigerians to reject the political motive behind the June 12 democracy day declaration by President Muhammadu Buhari. Sani, who however commended the President for the declaration, noted that his predecessors, failed to do so.He stated this yesterday at the 25th anniversary of June 12 presidential election organised by the Oodua People’s Congress (OPC) in collaboration with Nigeria Union of Journalist (NUJ) held at Excellence Hotel, Ogba, Ikeja, Lagos.Sani, who was the chairman of the occasion, said: “June 12 has now become an issue because Buhari honoured MKO Abiola and declared it democracy day. We accept the gift but we reject the political motive behind it.According to him, June 12 is about the people who were actively involved in the struggle against the annulment of the election. Meanwhile, the Aare Ona Kakanfo of Yorubaland, Otunba Gani Adams, has said that despite the passage of Not Too Young To Run Bill, it would be difficult for youths eyeing political offices to be elected. Adams, who also spoke at the celebration, commended Buhari for signing the bill, noting that the height of financial resources required to contest an elective position is a limiting factor for youths.He said money politics and godfatherism would continue to put Nigeria behind in the ongoing adventure of young people taking their place in governance globally. “How do young people thrive? Our youths are still struggling for basic things. How do they attract resources for electioneering where victory is for the highest bidder?” He asked. In another development, a legal practitioner, Mr. Joel Usman, has urged the President to set aside honouring Abiola with a national honour by first unravelling the circumstances surrounding his death. Usman stated this yesterday at a colloquium organised by the NUJ in collaboration with the state Directorate of Information Services and Grassroots Sensitisation (DISGS) to mark the Democracy Day lecture in Lokoja.The legal practitioner, who stated that the declaration without recourse to the National Assembly was faulty, said that while it was politically and morally expedient for the Federal Government to have honoured Abiola and declare June 12 as Democracy Day, it was legally incorrect.